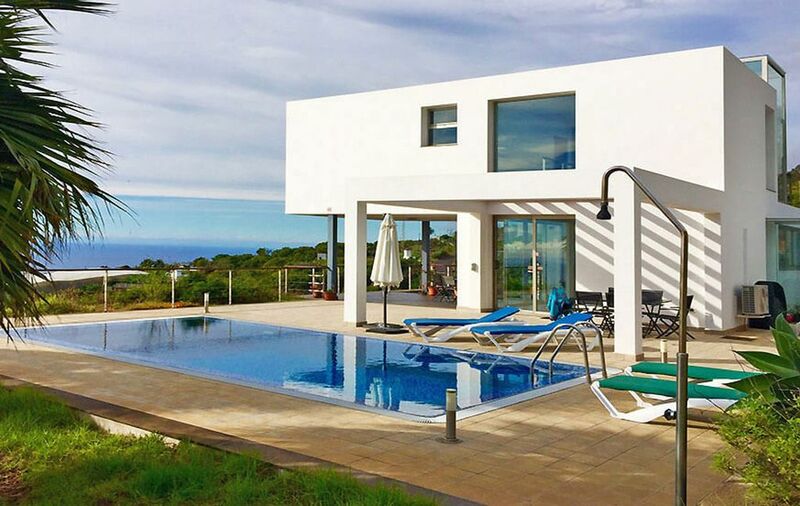 Modern and luxurious villa with private pool for up to 6 people on the sunny west side of La Palma. The beautiful villa with its large glass windows, stylish furnishings and beautiful details offers the perfect atmosphere for an unforgettable holiday. Outside you can relax in the private pool or in the jacuzzi. The holiday home is also the perfect starting point to explore the rest of the island. The town of Los Llanos with many shops, the beautiful beaches of the island and various hiking trails can be easily reached by car. On the ground floor there is 1 living room with dining area and kitchen, 1 bathroom with shower and 2 bedrooms with 1 double bed each. Upstairs there is 1 bathroom with shower and 1 double bedroom. The kitchen is perfectly equipped with ceramic hob, fridge, oven, microwave, dishwasher, toaster, coffee maker and juicer. For entertainment, guests have access to Internet, satellite TV and a DVD player. The outdoor area has a covered terrace, dining area, sun loungers, barbecue, garden, jacuzzi and private pool with solar pool heating (ideal bathing temperatures can not be guaranteed) and electric pool heating (for a fee).